Coach Neal Philpot watches on his offense as they continue their tear against Baxter, August 31. 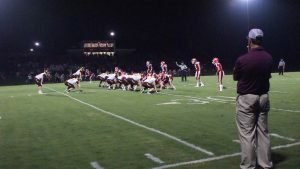 Girard kicked off their 2018 football season facing the Baxter Springs Lions. The Trojans started their season with an impressive shutout win defeating the Lions 26-0. In the first quarter, the running game was the story for the Trojans as senior’s Chandler Humble and Kreed Curran carried the load offensively. Humble scored the Trojans first touchdown with an 18-yard yard toss from senior Ty Norris. The Trojans began the second quarter off with a bang as quarterback Ty Norris threw a 63-yard dart downfield to senior Evan Troike pushing the score to 12-0. Late in the second quarter, Kreed Curran caught a pass scoring with 36 seconds remaining, bringing the Trojans to 18-0 at halftime. Girard’s defense came up huge for the Trojans throughout the game but in the third came up big with a fumble recovery in the red zone. This recovery then led to senior Kreed Curran punching it in with 3 minutes remaining in the third. From there, Baxter had no answer for Girard’s bludgeoning defense as the Trojans held the Lions to only 66 total yards of offense. Notable performances include senior quarterback Ty Norris, who finished the game completing 6-9 passes for 128 yards and two touchdowns. Also, senior running back Chandler Humble who rushed for 96 yards on 16 carries. Girard will move on next week to face the Galena Bulldogs as the road for a league title continues.